Xiaomi is all set to launch Redmi Go and Redmi Note 7 in the Indian market. Xiaomi teased Xiaomi Redmi Note 7 on twitter and indirectly is taking a dig on the Samsung Galaxy M series- its rival. Redmi- sub-brand of Xiaomi is seen boasting its 48MP camera phone on Twitter by its official account. Xiaomi did not mention the name of the upcoming smartphone in the video but is seen mocking the newly-launched Samsung Galaxy M Series. As per the report, the Samsung Galaxy M Series might be Galaxy M20. the video also shows the performance of Xiaomi Redmi Note 7 in which the smartphone scored 143,000 points with an M badge while the score of the Samsung Galaxy M20 was 123,000 points in AnTuTu. The company also tweeted an image in which it was seen mocking Samsung Galaxy M series by boasting 48MP camera of Redmi Note 7. The image reads “Feeling Powerless? Good things come to those who Wait.” along with a #MiPower hashtag. Samsung Galaxy M20 is built on home-brewed Exynos 7904 chipset of Samsung while the Redmi Note 7 is powered with Qualcomm Snapdragon 660 SoC. Redmi Note 7 is already on sale in China. The Xiaomi Redmi Note 7 sports a 6.13-inch full HD+ display with resolution 1080 x 2340 pixels and an aspect ratio of 19.5:9. It has a water drop-style notch design and comes with Corning Gorilla Glass 5 protection. The Redmi Note 7 is powered with Snapdragon 660 octa-core SoC, coupled with Adreno 512 GPU. The device runs on Android 9.0 Pie out of the box with MIUI 10. The smartphone packs large 4,000mAh battery. 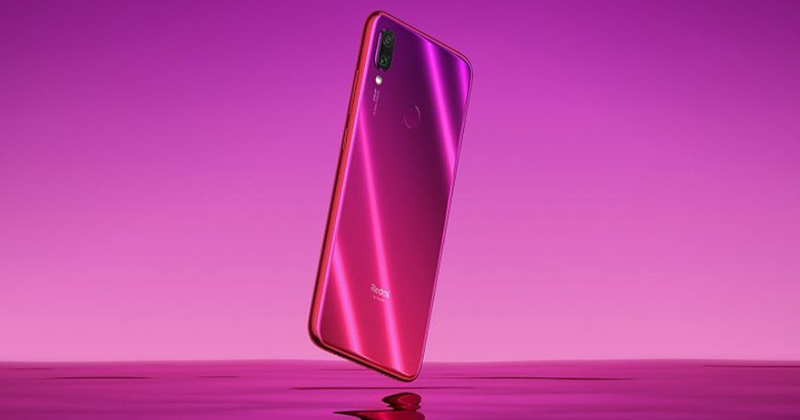 In terms of optics, the device at rear has 48MP primary camera and 5MP secondary camera along with a LED flash and at the front, it has 13MP camera for selfies and video calling. The smartphone comes with three different RAM variants- 3GB, 4GB and 6GB along with 32GB ROM/64GB ROM which can be expanded via a microSD card up to 256GB. Connectivity options include 4G, VoLTE, 3G, WiFi, Bluetooth, GPS and USB Type C.
In China, the Redmi Note 7 is priced at RMB 999 (approx. Rs 10,491). Let us see when Xiaomi will launch its Redmi Note 7 in India. Hope for the best.